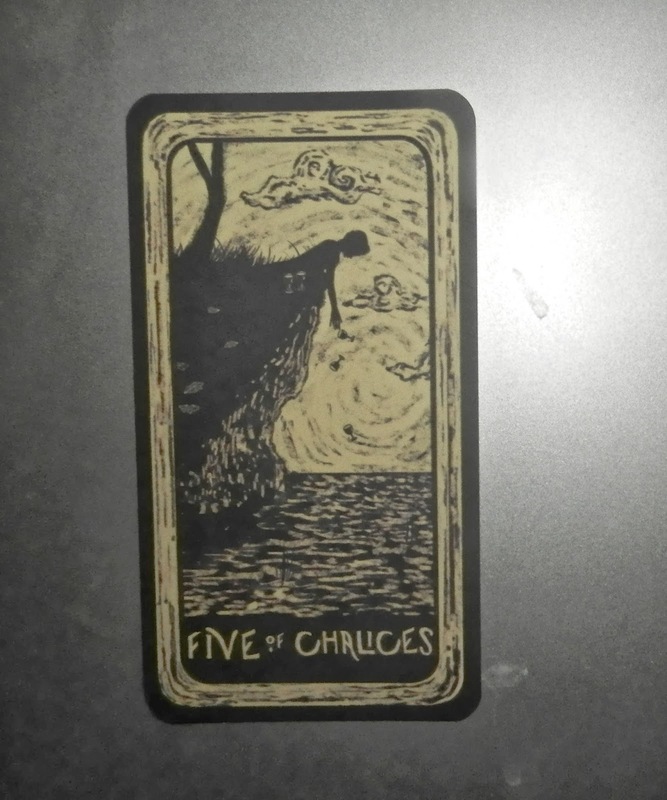 Weekend Reading: Five of Chalices from the Light Visions Tarot (more pics here). I really love a deck that gives me a different way of seeing cards and this Five of Chalices did just that. Usually a card of disappointment and feeling sorry for yourself, this particular one seems to be telling us that sometimes you voluntarily let go of something you once loved so it can find its way to another "lover." It's a way of recycling the energy. So this weekend ask yourself if you're holding on to something just out of the hope that one day you will want it as much as you wanted it once before. This can be a person, an idea, a sweater...anything. And if the truth is that you're no longer loving this thing, let it go. Letting it go does two things. First, it's a final act of love, freeing the thing to find something that loves it back. And second, it clears a space in you large enough to be filled by another love. Everybody wins! Now, a note about this deck. I'll be using it again, but in case I don't mention it, the card stock is to die for. It's like the stock for the Wild Unknown. All the imagery is original, non-traditional. I don't see any links or information about a lwb, but for me, the cards are pretty intuitive. And, the clincher, it comes in a lovely etched wooden box! For an independently printed deck, it's a bargain. I rarely feel this kind of enthusiasm upon receiving a deck. So if it looks like you'd dig it, buy it. It's an LE, so don't let it pass you by. This is indeed a very healthy way to make space in mind and closet.